My first read of Roger Oakland’s writings was a surprisingly good one. 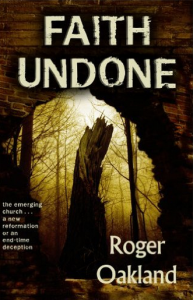 The subtitle of the book is: “The emerging church…a new reformation or an end-time deception.” Oakland pulls no punches in identifying the Emerging Church movement as a threat to the true church of Christ. It is well documented and full of current material from and about the leaders (McLaren, Sweet, Pagitt, Kimbell, McManus, Youth Specialties, etc) and sympathizers (Warren, Campolo, Leith Anderson, Drucker, Zondervan Pub., etc.) of this movement. Oakland covers developments within the movement such as mysticism, Eucharistic adoration, contemplative spirituality, Celtic spirituality, panentheism, centering prayer, Taize, Yoga, Sufism, “thin place,” and more. He also documents the movement’s growing love of Catholicism, hatred for Fundamentalism, passivity toward Israel, thorough ecumenicalism, and anti-evangelization of the world’s religions. Having read and studied early postmodernism myself, I must say that the emerging church movement is the clearest expression of mainstream postmodernism that we have seen in twenty years. The seeker-sensitive trend has been mere silliness compared to the outright assault by the emerging church movement on historic Christianity.